June is the month when elegant Foxgloves are at their best in many parts of Wales. I took most of the photographs in this post in Pembrokeshire where they adorn woodlands, roadsides and cliffs of the mainland and some of the offshore islands. Beautiful to behold, poisonous in the wrong hands yet life-saving when used for good, they have a long-held and fascinating place in our natural history. 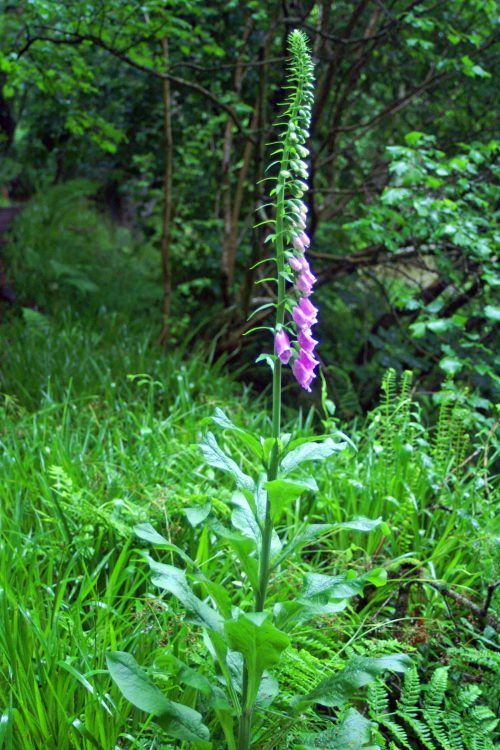 The graceful Foxglove is a downy biennial herb that thrives in acidic soils in a wide range of habitats. In their first year large downy basal leaves are produced, followed in their second year by impressive flower spikes from 3-6 feet (1-2m) tall. The plants die once they have seeded, but if the flowers are picked before they go to seed, the basal leaves will last another year and they will attempt to seed again. Three basic colours self-seed – pink, purple & white. They can come true to the parent plant where colour forms are isolated, but they cross-pollinate freely & many stands of foxgloves include all three shades. 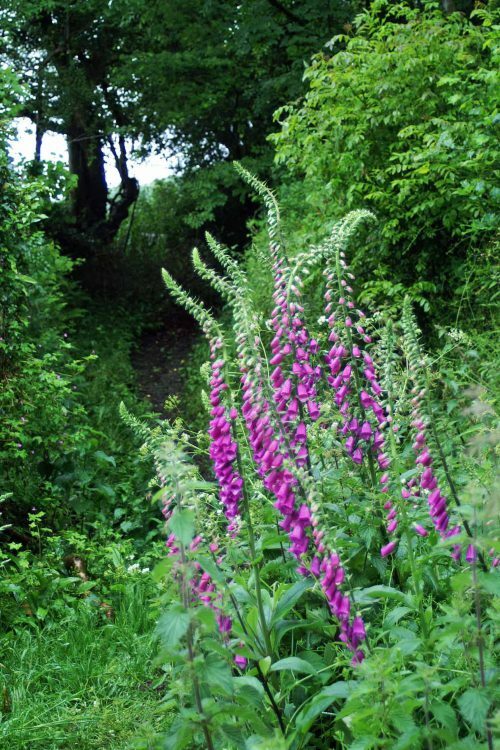 In Wales the Foxglove is a characteristic plant of early summer, thriving on acidic soil in the shady conditions of open woods, woodland clearings and hedge banks. But it also tolerates the open and exposed habitats of moorland and heath margins, sea-cliffs and rocky mountain slopes. It may also appear where ground has been disturbed, such as in newly cleared woodland, or where the old vegetation has been burnt. There have been many suggestions for the derivation of the name “foxglove”. It is an ancient name and exists in a list of plants as old as the time of Edward III (King of England from 1327-1377). The prefix ‘fox‘ has most likely been commuted over time from “folks”, who to our fourteenth century ancestors were the fairies, but so-called as to speak of them explicitly was believed to get their attention & cause them to do mischief. ‘Glove‘ may have come from the Anglo-Saxon gliew, which was the name for a musical instrument consisting of many small bells. So, put the two together and you could make it ‘Fairy Bells’. However it came about, Foxglove is the English common name we all know and love it by. 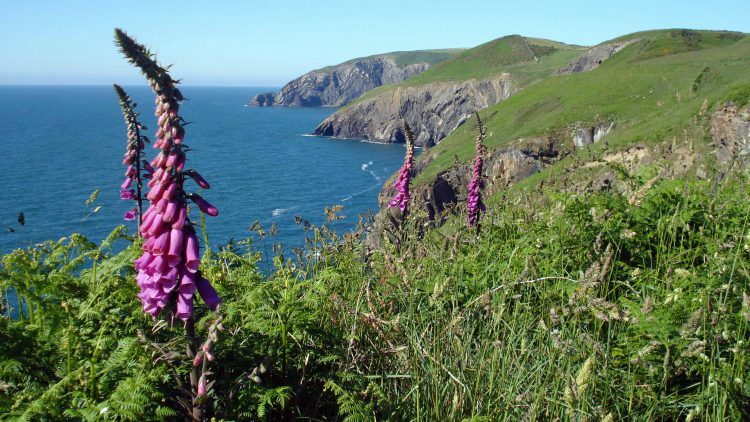 There appear to be two Welsh names for the Foxglove, one is Ffion, from which the popular Welsh female name is taken and the other Maneg Ellyllyn which translate as “The Good People’s Glove.” Similar then to Folk’s Glove and its association with fairies. In Gaelic they were Lus Mor, the Great Herb, for being the most magical of all herbs. 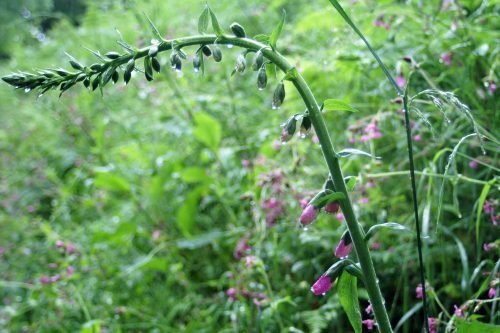 Plants that are widespread & medicinally potent invariably acquire a large number of folk-names, & the foxglove’s many names are a case study in our ancestor’s imaginations. A whole host of alternative common names reflect the association with fairies Fairy Caps, Fairy Gloves, Fairy Thimbles, Fairy Herb, Fairybells, Fairy-fingers, Goblin Gloves, Fairy Petticoats, Fairyweed. 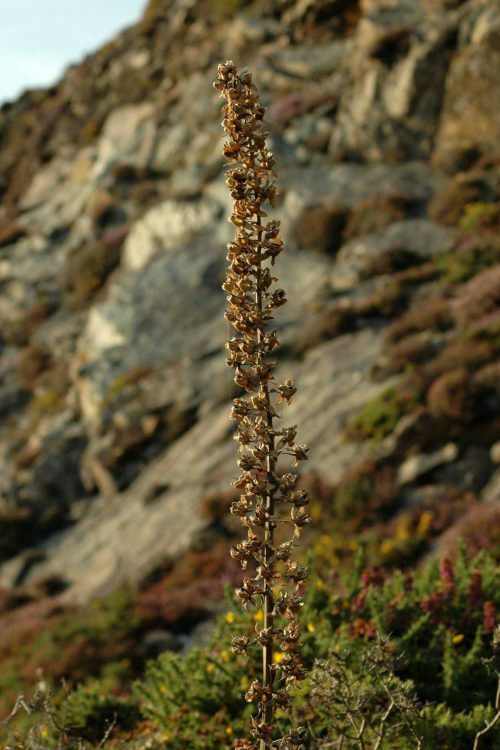 Another name, Dead Man’s Bells served to warn of the plant’s poisonous disposition. 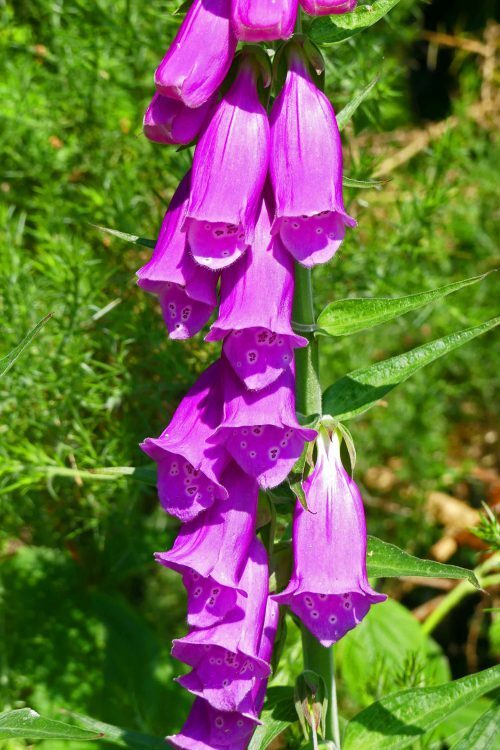 The names Flopdock, Floppydock, Flop-a-Dock, Flapdock, Popdock, Flop-poppy, Flop-top, Cowflop, Gooseflops, Rabbit’s Flowers or Bunny Rabbits all allude to the foxglove’s large soft downy leaves. One story has it that fairies would hide themselves inside the flowers. Mischievous children, wanting to hear fairy thunder, would hold one of the flower bell then strike the other end on their hand. The poor fairy, rightly upset and probably rather cross, would make a snapping sound, a clap of fairy thunder, while she escaped from her retreat. Another Welsh legend explains why foxgloves bend and sway so gracefully. It has nothing to do with the wind, but that as the flower is sacred to the fairies, it has the power of recognising them, and indeed all spiritual beings who pass by, and that it bows in deference to them as they waft along. Sounds more like a nightmare to me! Foxglove-digitalis purpurea. A plant that is beautiful on the outside but toxic at its heart. All parts of the plant are poisonous. 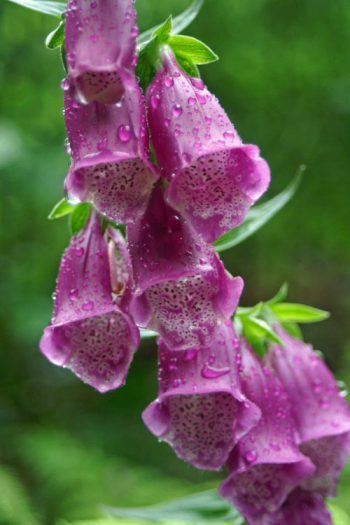 Foxglove is the source of digitalis, derived from several cardiac glycosides produced by the plant, and widely used as a heart medication. It is used to increase cardiac contractility and as an antiarrhythmic agent to control the heart rate, particularly in individuals affected by irregular (and often fast) atrial fibrillation and especially if they have been diagnosed with congestive heart failure. Which basically translates to it regulates the heartbeat. The use of Digitalis purpurea extract containing cardiac glycosides for the treatment of heart conditions was first described in English language medical literature by William Withering, in 1785, which is considered the beginning of modern therapeutics. With careful usage and expert pharmaceutical guidance, doctors have subsequently used digitalis and saved thousands of lives, but it is at the same time a dangerously toxic plant. Used wrongly it can cause heart palpitations, delirium, hallucinations, vomiting, & possibly death. 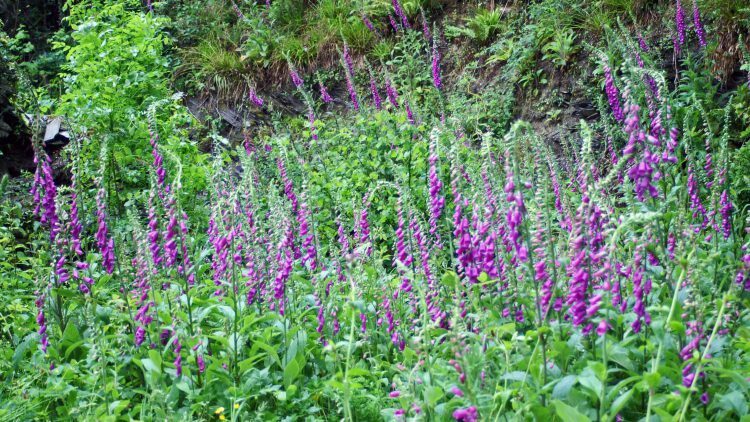 Modern-day herbalists have largely abandoned the use of digitalis because of its narrow therapeutic index and the difficulty of determining the amount of active drug in herbal preparations. Once the usefulness of digitalis in regulating the human pulse was understood, it was employed for a variety of purposes, including the treatment of epilepsy and other seizure disorders, which are now considered to be inappropriate treatments. Foxglove flowers were supposed to look like an animal’s open mouth. Within the doctrine of signatures this meant it must have some medicinal value in treatment of injuries of the mouth & throat. The speckles in the mouth of the flower were, according to the Doctrine symbolic of inflammation of the throat. Another array of folk-names reflect foxglove’s association with the mouth: Throatwort, Rabbit’s Mouth, Bunny Mouths, Tiger’s Mouth, Duck’s Mouth, Gap-Mouth, & Dragon’s Mouth. 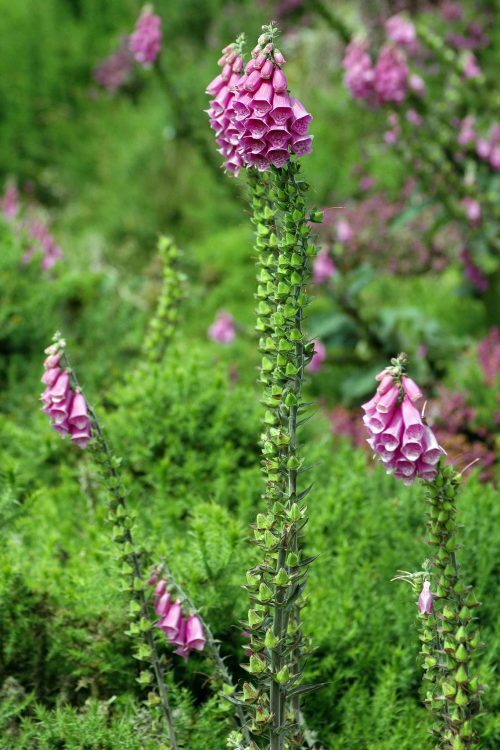 Another, less charming name of Scabbit Dock came about as in Culpepper’s day Foxglove was used in an ointment or shampoo for treating impetigo or “scabby head”. An association with midwifery probably gave rise to the names Granny’s Gloves or Granny’s Bonnets, & Witch’s or Witches’ Gloves. Witches & grannies, or at least midwives & other herbal practitioners, had many uses for this plant. Dr William Withering, the aforementioned man credited with discovering digitalis as a heart remedy circa 1775, apparently learned of its potency from an unnamed midwife.